The largest area specified in the Anglo-American Lend-Lease Agreement was designated at Stephenville, Newfoundland, for the construction of an Army Air Force Base. The total of 8,159 acres, selected in October 1940, was situated at the northeast end of St. George’s Bay. This was to become the largest military airport of the United States Army Air Force outside the continental USA. It was to be known as Stephenville Air Base. On 23 June 1941 Stephenville Air Base was officially named, by an Act of Congress, as Harmon Field, in honor of Captain Ernest Emery Harmon, a pioneer in United States military aviation history. Captain Harmon was born in Dallas, Texas on 8 February 1893. After receiving flight training, he was commissioned a Second Lieutenant on 5 April 1919 and received an appointment as Second Lieutenant in the regular army on 1 July 1920. Acting as a test pilot for the United States patent office, Captain Harmon was selected to pilot the Martin Bomber in the "round the rim" flight of 1929, which circled the boundaries of the US for the first time. While making a test flight from Maryland to Mitchell Field, New York, on 27 August 1933, Captain Harmon lost his life when his aircraft ran out of fuel near Stamford, Connecticut. On 1 July 1948 Harmon Field was renamed Ernest Harmon Air Force Base. Approximately 2,000 military personnel were stationed there during that year. In 1953, like all other bases and sites in Newfoundland and Labrador, Ernest Harmon became a part of the Northeast Air Command. Its mission was to participate in the supply and servicing of all US Installations in NEAC, including American bases in Greenland and Baffin Island. Ernest Harmon retained its importance as the first major overseas stop for military aircraft flying the North Atlantic to Greenland, England and Europe. The Strategic Air Command (SAC) operated out of Harmon from 1953 to 1958. However, in July 1953, the NEAC force increased considerably as the 61st Squadron with 12 F-94B's arrived at Harmon AFB. Three fighter squadrons were the most that NEAC ever had, although at one time there were plans for five squadrons (two at Goose, one at Harmon, Thule and Argentia). All the squadrons eventually converted to F-89D's. In 1953 Harmon AFB once again underwent another major construction program. Runways were lengthened and several new buildings were built, including a $2 million hospital with a 100-bed capacity. The well known "Black Hangar" was moved from its original location to the lower east side of the new aircraft parking area. Aircraft parking aprons were widened and the so-called "Boon Docks" were constructed to take care of the maintenance and servicing requirements of large aircraft. Underground refueling lines and hydrants were installed on the apron. Harmon became the home of the renowned 323rd F-102 Fighter Interceptor (Jets) Squadron. 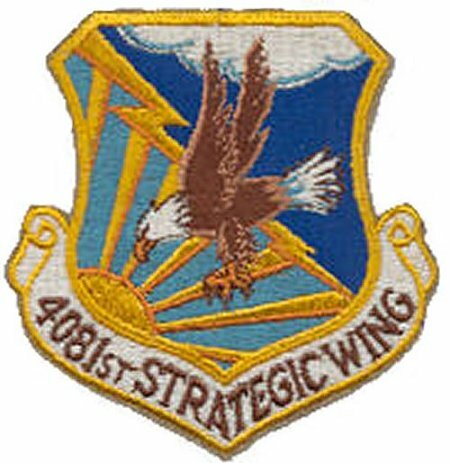 Over forty KC-97 "Stratotankers" of the 376th Air Refueling Squadron of the 4081st Strategic Wing under the Eighth Air Force, SAC, were also assigned to support the jet fighter squadron. All the activity was part of the air defence against a possible cross-polar attack from Russia. It was all part of the American-Canadian NORAD Defence Network. This activity grew rapidly under the 64th Air Division, when it took over from the Northeast Air Command in 1958, and continued to grow under the Eight Air Force, Strategic Air Command, until the base was closed in 1966. Command Headquarters for the 64th Air Division was located at Pepperrell Air Force Base, however, Ernest Harmon had its own defence mission. Over $10 million was spent on construction from 1958 to 1966. It was a most common sight around Stephenville skies to see two or three formations of F-102 jets or ten or more giant KC-97 supertanker aircraft maneuvering , before jointly departing to some rendezvous over the Atlantic to meet other American aircraft in the air and refuel them. A great feeling of anxiety hung over the approximately 1,200 civilians who worked on the base, when in 1958 the Northeast Air Command announced it was being deactivated. However it was learned that the base operations would continue under the new command of the 64th Air Division. This change in command for Harmon revitalized the base, as a new multi-million dollar expansion program was announced. The two Harmon Hilton dormitories, at a cost of approximately $2 million each, including the center core, a new hospital and additional Officer’s Quarters were only a part of the new construction program. The Strategic Air Command looked upon Harmon as the nearest refuelling stop. A new range of large military bombers, jet fighter aircraft and in-flight tanker refuelling aircraft came into being. For the next eight years Ernest Harmon Air Force Base flourished as a strategic part of the NORAD Air Defence program. However, all good things eventually come to an end, as in 1965 when the first deactivation of Harmon AFB was announced. Up to the time from 1957 over 5,000 United States Air Force personnel were stationed at Harmon. The annual operating costs for the base were about $17 million in 1962. Salaries for both military and civilian personnel amounted to more than $1 million a month. The total value of Ernest Harmon Air Force Base, at the time of closing, was estimated at $179 million. On 16 December 1966, Harmon Air Force Base officially closed and all buildings and facilities were turned over to the federal government. Like at Pepperrell Air Force Base, a Federal-Provincial Board was set up to determine how to utilize best all the buildings and areas. Ernest Harmon was the last base on the Island of Newfoundland to close. On 26 December 1966, control of all former USAF facilities came under the newly formed Harmon Corporation. Today, the entire complex is part of the Town of Stephenville and the Newfoundland and Labrador Housing Corporation. The airfield is used for commercial aircraft, and is known as Stephenville Airport. It is operated by the federal government. They operate one hangar and some buildings at the airport to take care of airport maintenance and emergency duties. Our thanks to John N Cardoulis and Don Nicks. Assorted photos of Stephenville - 2002. Assorted photos of Stephenville - 1999. Assorted photos of Stephenville - 1951.